This fun play workbench comes with 11 accessories! Kids can cut pretend wood pound nails and more. 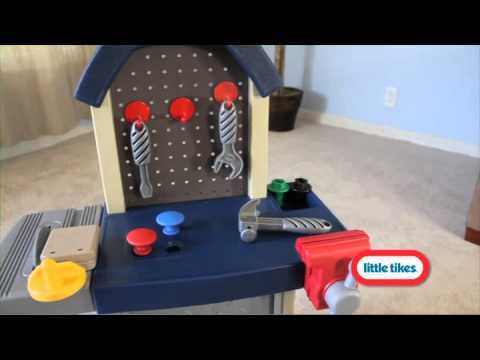 The Tikes Tough Workshop is just the right size for any bedroom play room or family room. Sliding doors provide plenty of storage. Large enough for kids to play together. With the Tikes Tough Workshop anytime is building time! It comes with all the tools your toddler needs to get started on any project!